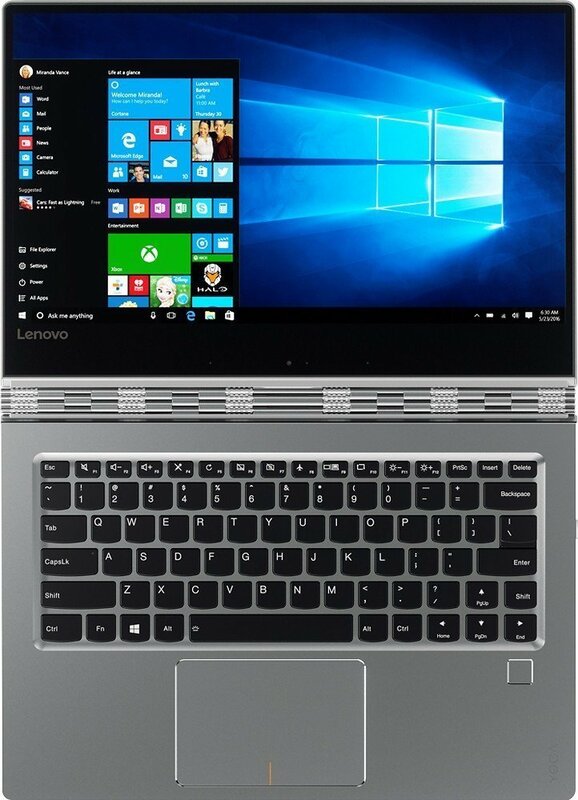 Silver Yoga 900 910-13IKB is a powerful and versatile 2017 model – hot new release convertible 2-in-1 laptop with a 13.9-inch Full HD touch display, a Kaby Lake i7 ultra low voltage processor, a good size SSD, the backlit keyboard and a long battery life. It has a precision-engineered multi-gear metal mechanism and is lightweight, very slim (0.56″) and compact and ideal for those that travel frequently. It weighs just 3.04 pounds (1.38kg) and is only 0.56-inch thick with the measurements of 12.72 x 0.56 x 8.84 inches. Please note that this is a certified refurbished product by a trustworthy seller with a strong track record on Amazon.com. It is inspected, tested and certified to look and work like brand new and includes all the original accessories as well as a warranty of 90 days. Technical specs include the latest seventh generation Intel i7-7500U dual core processor (4MB SmartCache) at 2.70GHz up to 3.5GHz with turbo boost and hyperthreading (2 cores and 4 threads), 256GB Solid State Drive that offers speed and performance, 8GB DDR4 memory at 2133 MHz (soldered) that gives you more than adequate power to multitask efficiently and 64-bit Windows 10 Home operating system. Win 10 is the most prefferred out of all the Windows releases so far. It includes some decent, familiar and new user-friendly features, such as the Win 7 start screen, Microsoft Edge browser and Cortana Personal Assistant. This is not designed as a gaming machine and does not include a dedicated graphics card but a built-in Intel HD 620 GPU with enough power to handle the daily multimedia tasks efficiently along with some gaming. 13.9-inch Full HD 10-point multitouch screen has the 1920×1080 pixel resolution and 16:9 IPS (In Plane Switching) panel with up to 178-degree viewing angles. 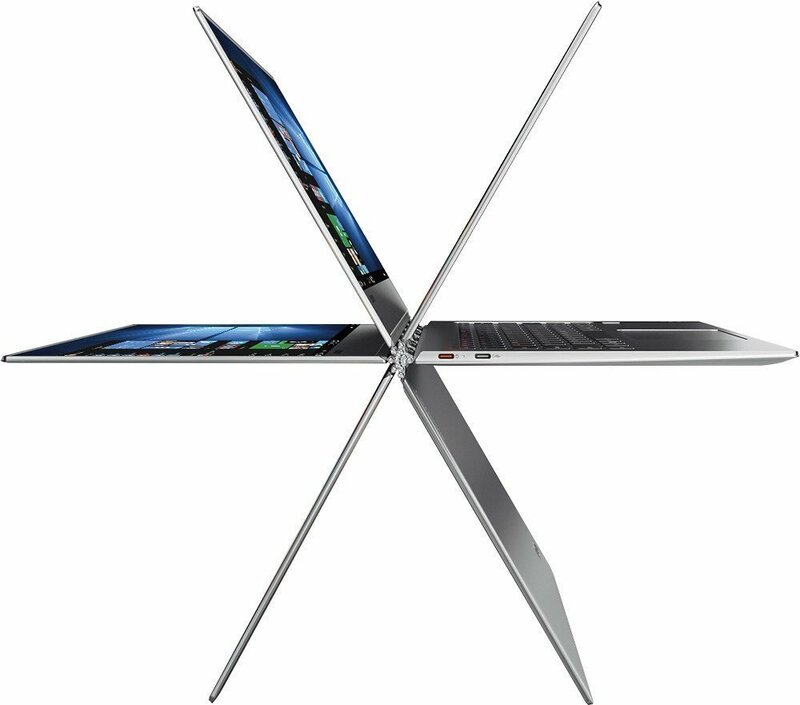 You can rotate it smoothly and effortlessly 360 degrees around the hinge and use it as a laptop, tablet or in other modes. And the sturdy hinge will hold the screen securely at any angle. It includes a decent quality high definition webcam for your casual Skype chats or work conferencing. The new Kaby Lake certainly isn’t just a simple rebranding of the previous Sky Lake processors. Intel i7-7500U CPU offers quite a bit of power, performance and higher frequencies (up to 25% enhancement in efficiency), while maintaining lower power usage. So you will be enjoying the longer battery life on the Yoga 910, thanks to the impressive efficiency achieved by the Kaby Lake processor. The 4-cell, 78 WHr lithium ion battery will let you be out and about and away from power outlets all day long. It offers around 8 hours of battery life on average use in practice. Connectivity options include the 802.11ac wireless, Bluetooth 4.1 to connect to other Bluetooth enabled device wirelessly, a USB3.0 port, a USB3.0 Type-C port, a USB2.0 Type-C port, a headphone/microphone combo jack and an audio-out port. A couple of people mentioned a fan noise from this machine, but as long as you have the latest drivers and BiOs settings there will be no fan noise at all. The latest Lenovo Yoga 910 is quite a special machine, for those that are out and about or travel often and want something powerful, compact, lightweight, portable with a very high quality touch display and a beautiful design. It is definitely worth considering if you think it is within your budget. You also have the option to choose the Yoga 910 Special Edition (80VGS00300) with a glass lid, 4K Ultra HD resolution touchscreen, 16GB memory and 512GB SSD at a higher price on the same Amazon product page.